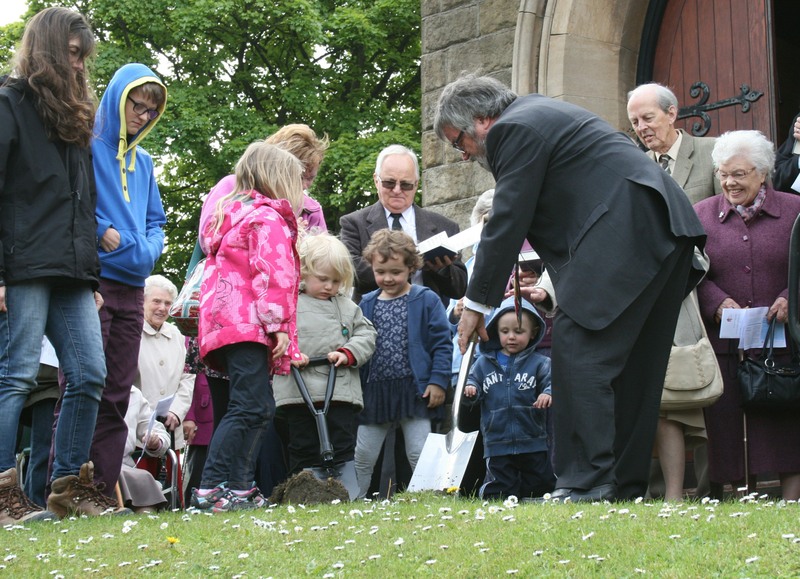 Lily, Stella, Max and Archie, four of the youngest people at church help the minister, Rev Ian Lucraft, to cut the first sods of grass for the new church hall. William, looking on here, help Ian to replace them afterwards so no one tripped up over them! The church was full for a short service before we all processed outside where eight of the older members, from the former Christ Church United Reformed Church, the former Wesley Methodist Church, and the former West End Methodist Church spoke moving words. Four of the older members offered their faithful commitment over the past decades to the stewardship of the churches into the safe keeping of the next generation, who accepted their responsibility to build a church of Jesus’ disciples here, showing his love and service, and seeking justice and peace for all humankind. The builders, T and C Williams, a well-known Sheffield building company, have now moved onto the site and plan to demolish the old hall and build the new one in 22 weeks! We’ll keep the website updated with progress as we go.